Too many people are still dying from kidney disease! There are currently 5191 people waiting in the UK for a kidney transplant. Kidney Disease may effect up to 3 million people in the UK. Many are undiagnosed. 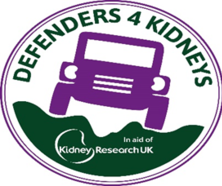 A group of Land Rover Defender lovers including one grateful owner of a transplanted kidney, will take a tough, off-road based route visiting the Renal Transplant Centres of mainland Britain between 23rd June and 8th July 2018. The team will be using as many Green Lanes as possible, avoiding major roads and motorways. The kidney shaped route will take us around the UK, covering about 2500 miles taking us over all types of terrain. We will be camping out in the Great British wilderness! Kids Kidney Research. We will also meet the researchers and scientists and witness first hand the amazing work being undertaken. One of the team spent three years on dialysis which was difficult for his young family. Eventually he had the amazing fortune to be offered a transplant. The recovery period and the setbacks were not easy but he eventually returned to good health. This challenge celebrates the lives saved by transplant, those still waiting and the many friends and relatives lost along the way.